It's January and the winter chill is clinging desperately to the city of Omaha, despite our best efforts to shake the snow and bitter winds. 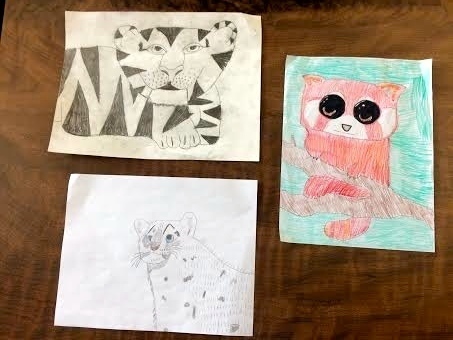 On campus at the University of Nebraska at Omaha this past week, students and faculty were invited to the Barbara Weiss Community Engagement Center to warm up and learn about some endangered animals that live in and love the cold! From February 9th through the 13th, our Cold Weather Critters: Coloring for Conservation display generated awareness in the campus community about some of our favorite cold weather animals like the Red Panda, Snow Leopard, and Amur Tiger while highlighting Conservation Fusion's partner organizations: Red Panda Network, Snow Leopard Trust, and Wildlife Conservation Society's Russia Tiger Project with the help of Des Moines' Blank Park Zoo. Those who stopped by were encouraged to learn more about all participating organizations and to vote for their favorite coloring contest submissions from area elementary classes. Students, faculty, and community members showed their love for conservation and these cold weather critters... Just in time for Valentine's Day! 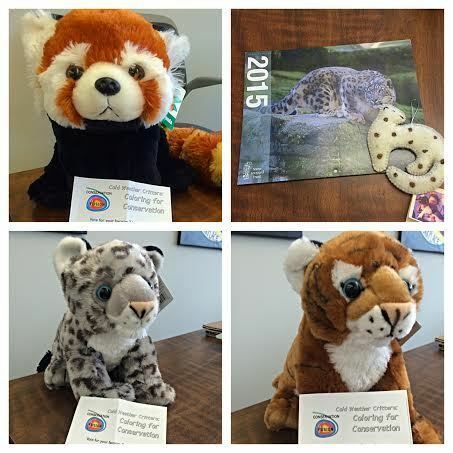 Watch the video above to see our Cold Weather Critters display! Superb and fantastic post. I am really happy after find your blog because i need it. Thank you so much. Check their Here is the good big special compilation falls and accidents. Supercar driver idiots Crash Compilation #3 and keep yourself and others safe Please. Thanks for sharing post. This is really good one to be possessed with portraits. This is a nice and well managed website. Coloring is a nice activity which kids love a lot. Such activities should be promoted. I hope you will keep this website updated so users can come and read interesting stories.I am very impressed by the way you share nice and valuable content. I am a great admirer of such types of websites. The design is good. The information contained in this website is full of informative insights. Such creative events help the students to aware about some of our favorite cold weather animals. They have done the coloring works beautifully. I loved watching their video which showed us the highlights of Cold Weather Critters. Cheers!! I cherished the way you talk about the theme awesome work a debt of gratitude is in order for the share Your instructive post. Whenever you are using a dating application such as this, constantly keep in mind to be patient. In situation, you do not obtain a return message, sending arbitrary messages numerous times can only aggravate the receiver as well as could leave you with a sorry number. There are 3 strategies to make musical.Ly sign in account. Adhering to are the 3 methods to subscribe an account. Email address. You can plug your ipad into your pc or mac and also sync the gadget. You could likewise choose to just sync applications. On the leading left corner of the web page, click DFCU online. On the new web page that opens up, enter your member number in the first text box. You can likewise decide to confirm your account by entering the security code from your bill, the last four figures of a repayment card you carry file or the last 4 personalities of the MAC address from an item of Range equipment.